From time to time I like to search for ‘Golgi apparatus’ and ‘plant cell’ in Twitter, because I love to get a vibe for the current perception of organelles by students. Usually it is a mix between ‘haha, Golgi apparatus, such a funny name’ and ‘why do I have to learn about plant cells, zzzzz’. 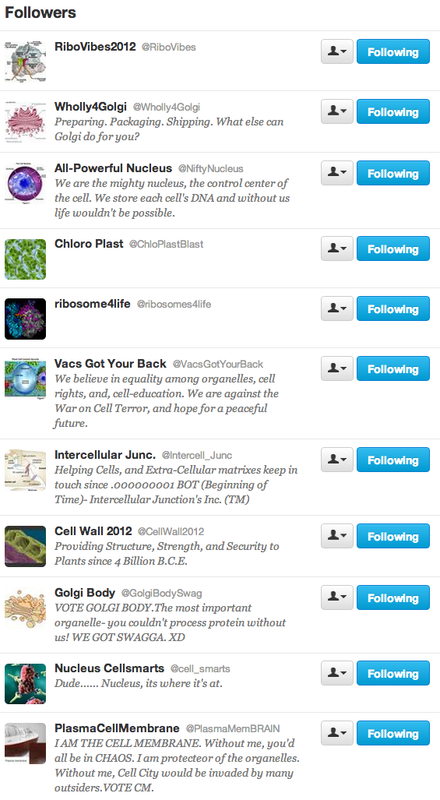 Last night however I suddenly noticed two different account that had ‘Golgi body’ in their Twitter name. I was intrigued! Then I realised that there was a sudden surge of organelle accounts – and I was even more stunned when I saw that they were campaigning to be elected as President! Upon further research I found out that this was a biology classroom project for biology highschool freshers led by ‘Mr Graba’ (@Mr_Graba). The general idea behind this project came from the AP Biology Listserv. It includes the creation of campaign posters, flyers and ‘Election Day’ where every organelle has to give a speech on why they are the most important one, followed by student votes. It was Mr Graba’s idea to extend the project to Twitter. I am very grateful for this because it allowed me and other cell biologists to cheer for our favourite organelle (yes, we sometimes do have those fights too!). Mr Graba emailed me this morning to say how stunned his students were that real scientists followed and interacted with them: ‘I cannot tell you how excited my kids and I are about having scientists from as far away as England and France getting involved in our little classroom project!’ I can tell you that we scientists are having A LOT of fun with this project! 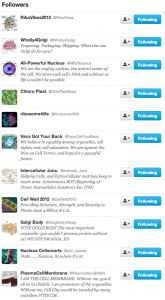 I have put together a list with (hopefully) all organelle accounts. So if you would like to have a look, support your favourite organelle or help them mudsling the other organelles check out the Twitter list with all participating accounts ‘Organelle Wars’. Here is a Storify of some of today’s funniest tweets.